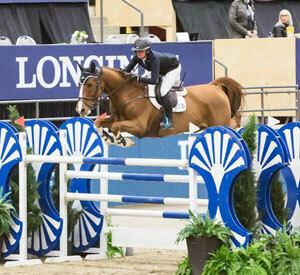 Erynn Ballard’s grand prix mount, Appy Cara, has been sold to Ramiro Quintana of Argentina. Erynn Ballard’s grand prix mount, Appy Cara, owned by Angelstone Partners, has been sold to Ramiro Quintana of Argentina. Ballard and the 10-year-old KWPN gelding had a successful 2015 season, with highlights including a dramatic jump-off win during the second week of the Royal West tournament in Calgary, Alberta. The pair took first place in the $45,000 GGT Footing & Whiteline Structures Classic 1.45 m. Earlier in the year, they competed on the fourth-placed Canadian team in the Furusiyya FEI Nations Cup competition at CSIO 4* Coapexpan, in Mexico. In addition, the pair had a second place in the $75,000 RAM Equestrian Grand Prix CSI2* at the Caledon National CSI2*, plus several top five placings at the Angelstone Tournaments this summer. As of December, 15th Appy Cara was ranked fifth in Leading Canadian-owned horses, with $101,524 in earnings. Ballard said, “In an Olympic year it’s a very hard decision to sell your best horse. The last two seasons with Appy Cara are what dreams are made of. We represented Canada in Mexico on the Nations Cup team and had huge results at the highest level of the sport.